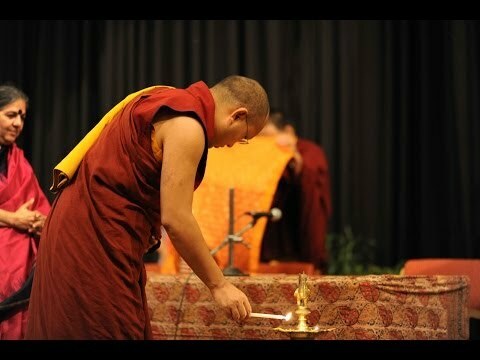 Reflecting his keen interest and commitment towards environment issues, on 1 October 2013 the Gyalwang Karmapa was chief guest at the 2013 Bhoomi Festival in New Delhi. With the theme of ‘Sacred Himalaya, Abundant Himalaya’, the environment festival was organized by Navdanya, a network of organic producers and seedkeepers spread throughout India, under the leadership of renowned Indian scientist and environmental activist Dr Vandana Shiva. In his opening speech the Gyalwang Karmapa began by offering his prayers for all those who lost their lives in the recent flood disaster in the Indian Himalayan region of Uttarakhand. He pointed out that in the modern world we are witnessing rapid and destructive environmental changes, and that these changes are due to human activity. He urged those gathered to look deeper into the root causes behind this.